The Land of Enchantment is known for plentiful art and cultural experiences, but the small city of Artesia has managed to stand apart from the rest. Nestled in the southeast corner of New Mexico between Roswell and Carlsbad, Artesia’s unique culture dates back to the 1800s. The city really started to gain popularity when homesteaders started coming in droves in the 1880s because of the Artesian water system. Before that, the area had been part of John Chisum’s cattle empire. When the railroad came in the 1890s, the town was named Miller after a railroad employee. Later, the town name was briefly changed to Stegman, after Chisum’s niece and the town’s first postmistress, Sallie Chisum, who was married to Baldwin Stegman at the time. The final name of Artesia came about when the first Artesian well was drilled on Sallie’s land. The town of Artesia was officially incorporated in 1905. When oil started showing up in water wells, investors and drillers took interest in the area. In 1924, the Illinois #3 oil well was a success, and Artesia’s oil history officially began. Since then, the city has seen the Great Depression, ups and downs in the oil industry, and drought, but has always maintained a resolve not only to survive but to thrive. Today, the history of Artesia is present everywhere you look, and the city was designated a New Mexico Arts and Cultural District by the New Mexico Arts Commission in November 2013. Here are 11 of the best ways to experience the culture for yourself. The visitor’s center at the intersection of 1st and Main is an ideal first stop on your visit. Here, the helpful staff can provide context for the attractions you’ll be exploring, give recommendations for restaurants, and more. Grab a map while you’re at the center and get all of your questions answered. 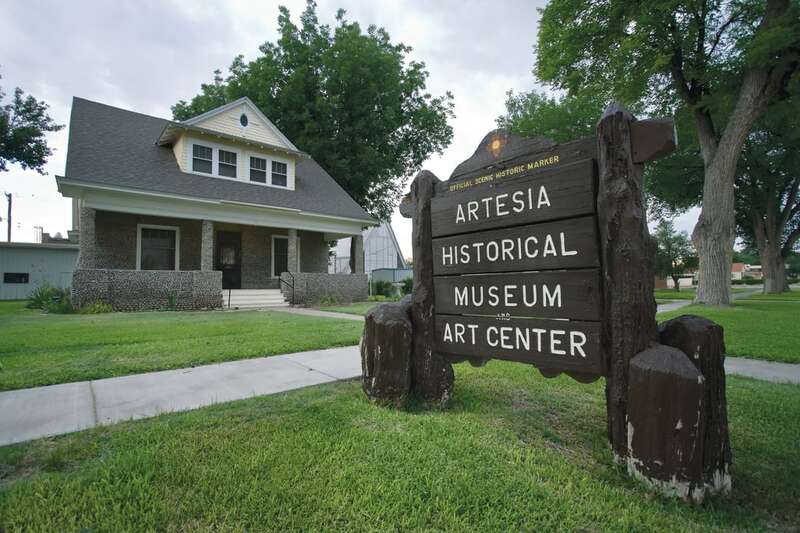 The Artesia Historical Museum and Art Center has served the area since 1970 and is a celebration of southeastern New Mexico’s rich heritage. Here, you’ll find old photos, Native American artifacts, farm and ranch displays, hands-on children’s exhibits. Don’t miss the Art Annex Gallery next door—there’s always something new to see. Downtown Artesia is marked by 11 impressive bronze statues lining Main Street. Each statue is a larger-than-life depiction of something that sets this region apart from the rest You can explore the area by visiting each statue while also learning the stories they tell. Take time to visit each one, and don’t forget to bring a camera. The Artesia Public Library is a community gathering place for locals, but also a must-see attraction for visitors to the area. Along with a large collection of books, the library is home to a spectacular mural painted by famed New Mexican artist Peter Hurd. This little area is a nice place to rest in the shade, do some people watching, and enjoy a picnic lunch. Walk under the archway and you’ll undoubtedly become curious about the colorful murals that line the walls. Depicting the history of the area, two of the murals were originally created in 1976 by the Artesia Junior Women’s Club with help from local art teacher Helen Mapes. The third mural of the New Mexico landscape was added in 2004 by local muralist Noel Marquez. 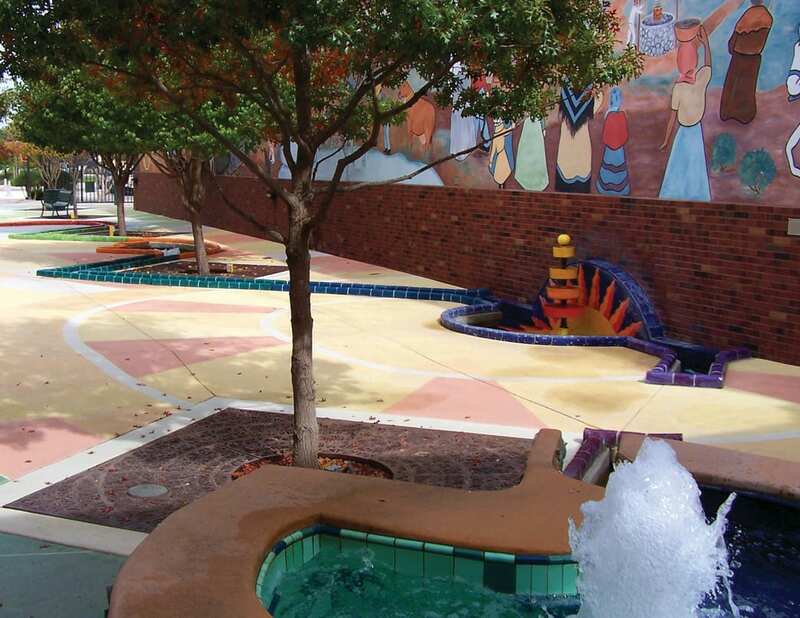 Look carefully at the thousands of colorful tiles in the fountain—they were all handcrafted by Shel Meymark, an artist from Embudo, New Mexico. Baish Veterans Park sits in front of City Hall and honors the area’s past and present veterans. The memorial was designed by celebrated New Mexican architect, José Zelaya, and is a sight to behold. Sit still and pay your respects, or walk among the names and the beautiful “Freedom’s Fire” sculpture. Experiencing the great outdoors is very near and dear to many New Mexicans’ hearts. Get some fresh air and stretch your legs on the tree-lined greenbelt at Eagle Draw Park, which is also the hot air balloon launch site during the Artesia Balloons and Tunes Festival. Bring the kids along to play on the swings and playground equipment. Make sure to stop at each of the permanent exercise equipment stations along the 3.2 mile trail. This local stadium is the only place to be on a Friday night during football season. 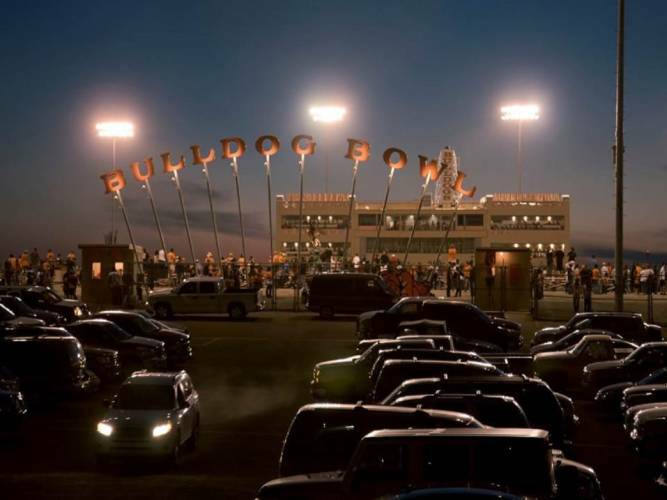 The whole town comes out to support the high school team and on game day, the Bulldog Bowl buzzes with energy. The Ocotillo Performing Arts Center first opened in 1935 as the Ocotillo Cinema. It was a popular movie theater until it closed in 1959. The building was turned into Clifton&apos;s Cafeteria in 1961, then the Townhouse Cafeteria in 1964. After closing its doors yet again, the building remained unused for several decades. 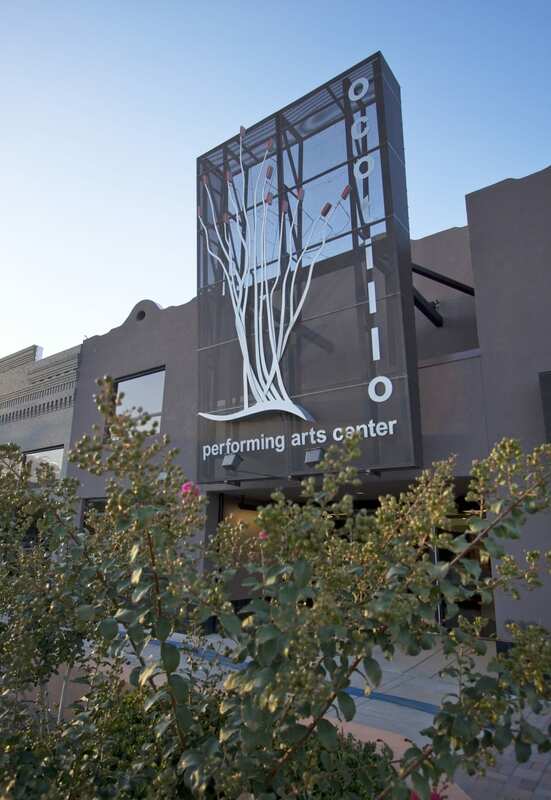 In 2001, the Artesia Arts Council gave the building a new life and opened the Ocotillo Performing Arts Center several years later. The center hosts concerts and events at the venue year-round. You can also get in on the action yourself with music lessons, dance lessons, or painting workshops—no experience necessary! The Main Event Car Show & Cruise: From classic cars to tractors, there’s something for everyone at the car show. 4th of July Fireworks Extravaganza: Artesia throws a spectacular bash for the Fourth of July, complete with fireworks and the “Fireman’s Olympics.” Don’t miss it if you’re in the area this summer! Red Dirt Black Gold: Locals look forward to the Red Dirt Black Gold festival to celebrate Artesia’s heritage as an oil and ranching city. The event features the Oilfield Olympics, live “red dirt” music, and a beer and wine garden. Artesia Balloons and Tunes Festival: Hot air balloons are a unique piece of New Mexico’s culture, especially since the crisp, high-desert air provides the perfect setting for flying. Every year on the first weekend in November, the sky is filled with colorful orbs and the city is buzzing with live music and events. Light Up Artesia: This holiday bonanza rings in the season with hot chocolate, a parade, dazzling light displays, and holiday shopping.